ICG canyoneering backpacks set the standard for comfortable, intelligent, and durable design in the brutal canyon environment. Our Heaps packs ride as smoothly as backpacking packs, but sacrifice unneeded bells and whistles to deliver sleek, technical performance. The packs shed water quickly, rarely get caught up on canyon debris, and are big enough to stow everything we need on long guided days. With 200+ user days, 700+ immersions, and countless chimney squeezes and grating stems last season, my Heaps Pack survived and served us faithfully. Imlay canyoneering packs are invaluable tools in the canyon, and we love them. Thanks for the great work, Tom. Here in America, a canyoneering pack must be both effective and sufficiently durable for the rigors of the sport. We have combined - HYBRIDIZED - the best of American-style, sophisticated Cordura nylon packs with durable plasticized PVC-laminate fabric to produce canyoneering packs that do both - work AS PACKS, and resist rapid destruction. SUSPENSION Every Imlay canyoneering pack has a sophisticated suspension appropriate to the volume of the pack and the anticipated load. Heaps and Kolob packs sport our light-yet-rigid Tube-Light frame. Twin tubular aluminum pack stays provide rigid support at minimal weight. 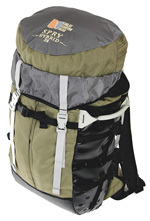 The stays are linked to the pack body via plastic demi-sheets that fit firmly into the back panel of the pack. A triple layer foam pad provides 3/4" of padding between your back and this structure allows the pack to adjust to your individual shape. Shape is designed in to the panels of the pack, but the system is adaptable and fits a wide range of back sizes and shapes. 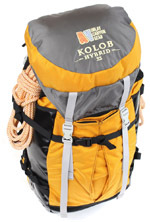 Substantial bi-laminate shoulder straps and a bull-horn-shaped, wrap-around conical hipbelt are lined with p-plush nylon 3-D mesh to complete our top-of-the-line suspension, suitable for carrying big, heavy loads for those Grand Canyon Mega-Days. Smaller packs need less, and therefore get less. The Spry and Mystery packs have a flexible plastic sheet with a 1/2" of foam padding, with wing-style hipbelts and re-curve shoulder straps. The Leprechaun has a nice piece of foam, sufficient for its modest size. CONSTRUCTION A canyoneering pack must be able to drain quickly, and Imlay canyoneering backpacks are designed from the start to expedite expellation of water when you exit a pothole. Each pack is two packs in one - an INNER pack made from heavy-duty nylon mesh, and an EXTERIOR of PVC-Laminate and 1000 denier Cordura nylon fabric. The mesh allows water too move freely to the generous punched-hole drains. Care is taken that no non-draining pockets are created - for instance, the bottom panel of the lid is entirely mesh, so water cannot get trapped in the lid to trickle down your neck as you hike to the next pool. 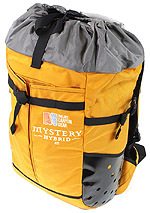 SHAPES Imlay canyoneering backpacks are carefully shaped to minimize the encumberance to downclimbing and rappelling. The bottom of the pack is tightly shaped to present a compact, smooth shape to the environment, and to hang-up as little as possible on downclimbs and slides. 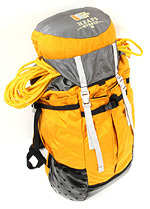 Lack of straps and gadgets on the lower part of the pack minimizes the chance of a strap or flap lodging in a crevice. FEATURES An inside watertank pocket allows use of a reservoir, if you want. The strong handle allows secure dangling while rappelling. Side compression straps can hold a rope or wetsuit securely. Large pleated back pockets are sized to fit a helmet, so it need not hang on the outside to flop back and forth; with a drain, of course. The capacious lid has a heavy #10 zipper with double-layer 1000 denier Cordura flap, carefully styled for easy access, and easily adjustable back and front. Make me smile! The Lep is a canyoneering pack just big enough for what you need, and not big enough for what you don't need. 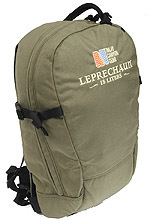 When canyons are dominated by climbing and any pack at all is a substantial encumbrance, the Leprechaun really shines. It is smaller than you are, and glides gracefully through the canyons, just like you do. Ideal for canyons where WAY less is WAY more functional.